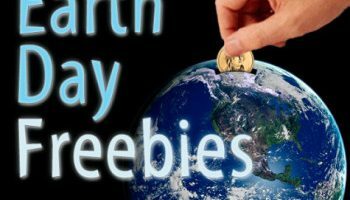 When I was looking through SeaWorld Information for my trip to Orlando I thought about the food budget often. Because I was getting a package for everything (see Save on Family Travel for how I did that) the food was the wild card for our budget. It was the only thing I couldn’t predict. 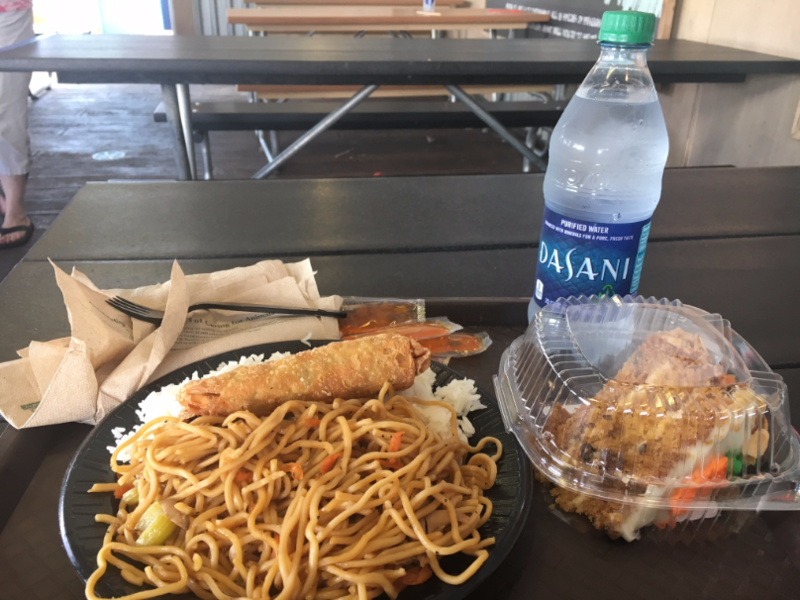 I decided to check out the SeaWorld Orlando All Day Dining Deal and see if it would be worth the money. 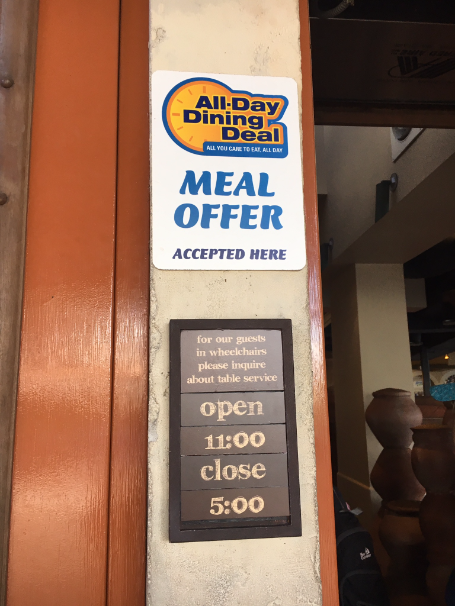 What Is The SeaWorld Orlando All Day Dining Deal? 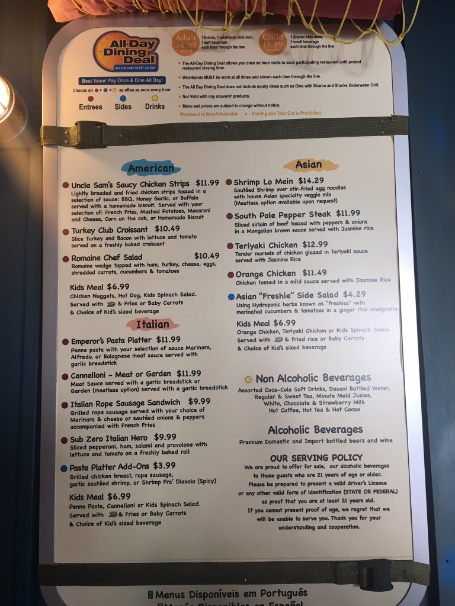 At the front gate, or at most of the finer dining areas, you can purchase the pass (a wrist band with a bar code) to visit all the nicer eateries with almost all of the menu items included. 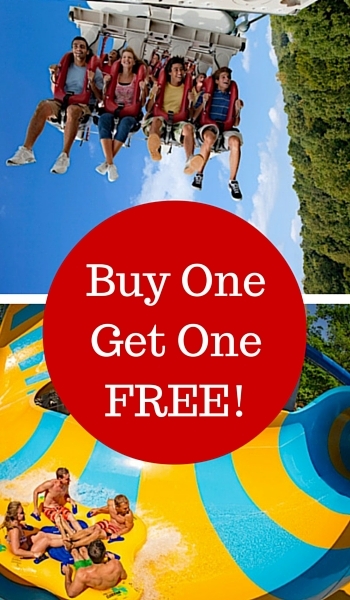 The price of the SeaWorld Orlando All Day Dining Deal is $34.99 for each adult and $19.99 per child. 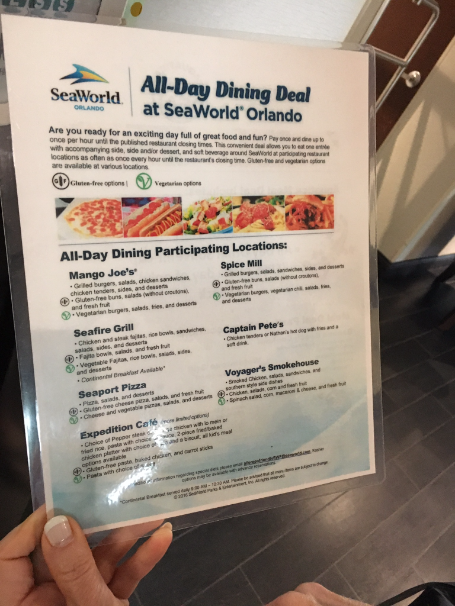 With the SeaWorld Orlando All Day Dining Deal pass, you get one main entree (which is often a platter and includes a side anyway), a drink (soda or water) and a choice of a side or dessert. There are restrictions to which dishes you can get, but the limitations are few, and easy to work around. Some stuff was even able to be custom ordered if they didn’t have a line out the door. After eating, you have an hour and then you can go back and get more food. One of the specific reasons we got it was to be able to get a bottle of water every hour. Water is $3 a bottle in the park. The park was open from 9 a.m. to 6 p.m. We drank a bottle almost every hour! 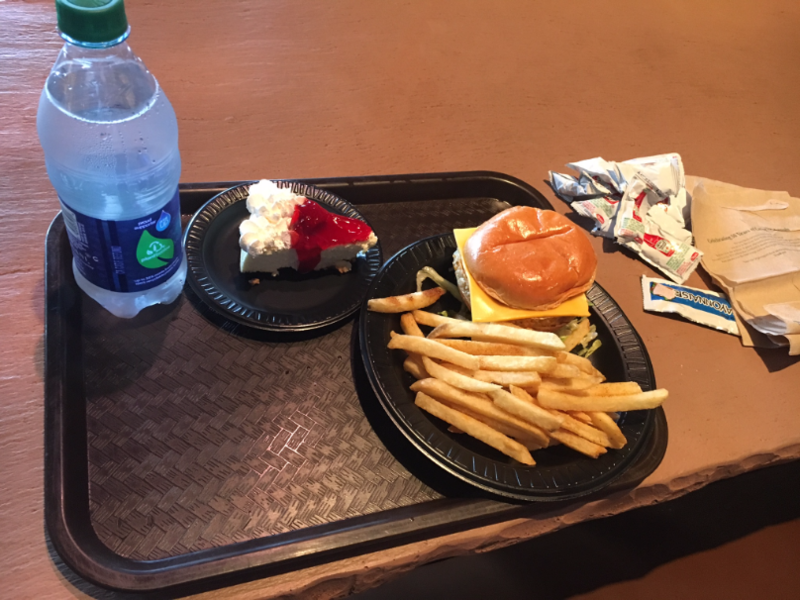 The SeaWorld Orlando All Day Dining Deal doesn’t cover the street vendors or merchandise. 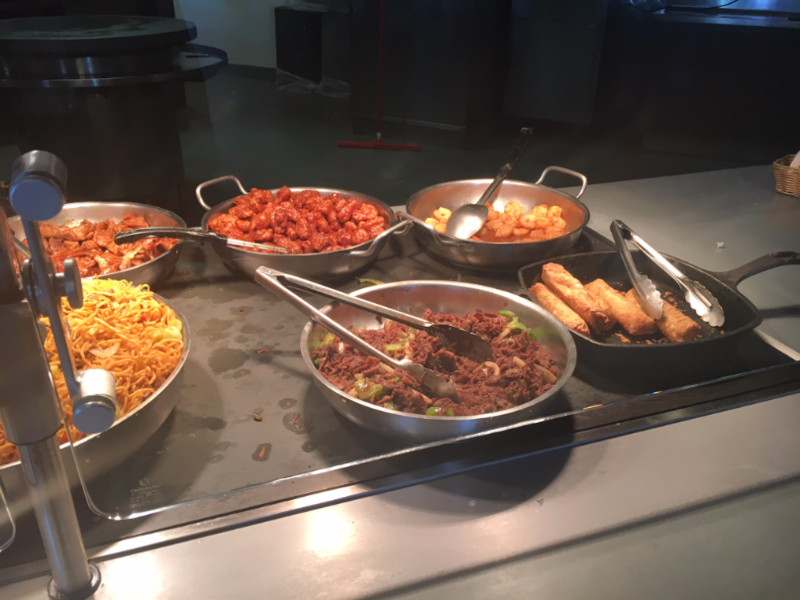 There are a few items in each restaurant that are not covered (such as the baby back ribs or allergy free snacks), but otherwise you have a free reign of the food everywhere you go. So What Did I Think (and how to maximize it)? 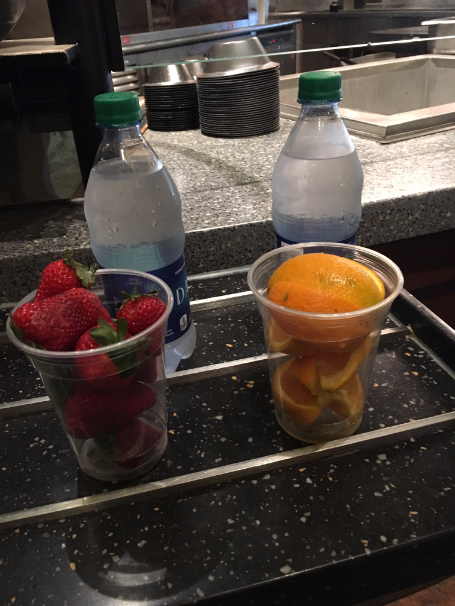 We had eaten breakfast at the hotel (it was included in our package) but wanted to go ahead and grab a bottled water first thing when we hit the park. The only place open for breakfast is Seafire Grill Fajitas. You can see in the picture above breakfast was pretty simple- lots of muffins, yogurt, fruit and some pastries. We grabbed strawberries, oranges and bottled water. The total would have been $7.62 each without the package. The fruit was WONDERFUL- incredibly fresh and juicy. We took these to one of the shows and ate while we were entertained. For lunch we ate at Spice Mill Burgers. We each got a Veggie Burger and french fries (which counted as just an entree) and bottled water. Mom got watermelon as her dessert and, because I am a good blogger and want to give you guys as much information as possible, I got cheesecake. Our total together would have been $38.58. I absolutely loved the restaurant. 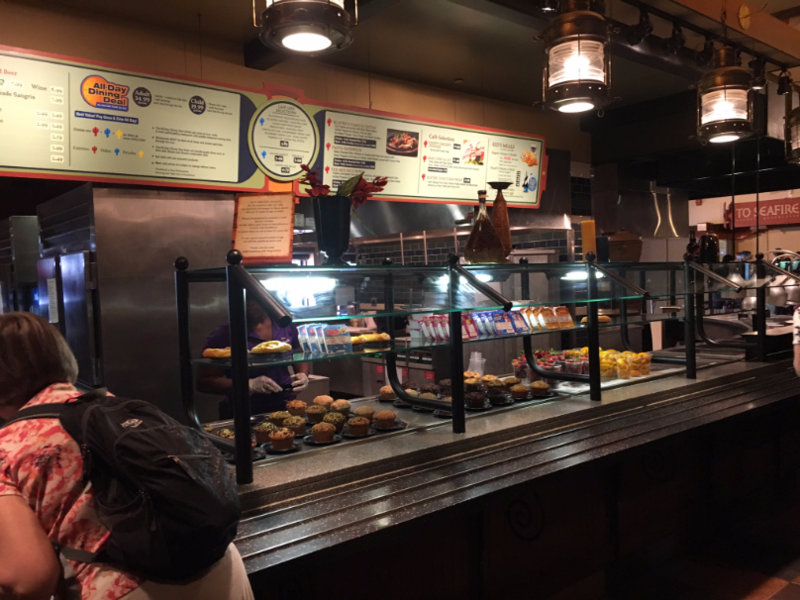 I couldn’t help but compare the park to Busch Gardens Williamsburg and it doesn’t have any places to eat like this. Completely inside, air-conditioned with booths- it felt more like being in an actual restaurant than I am used to in a park. The food was VERY good and I recommend the cheesecake (although keep reading because it wasn’t the best dessert I had). 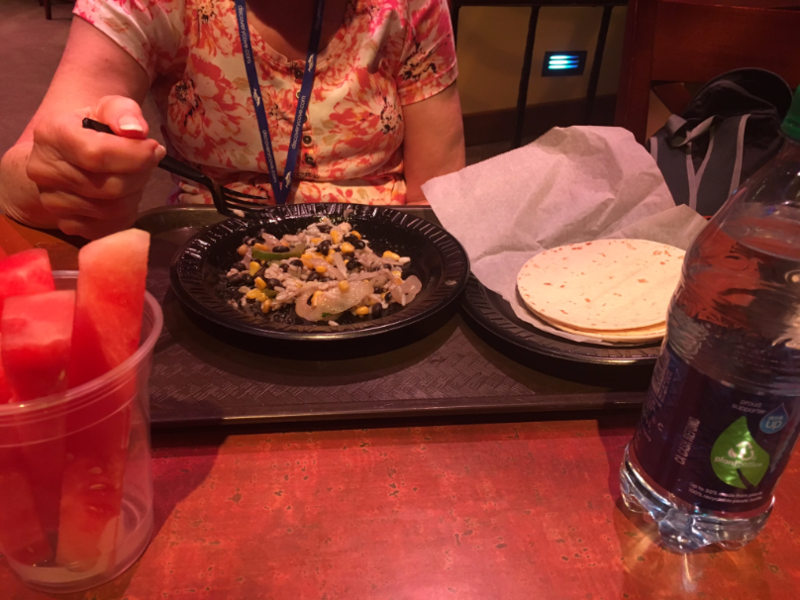 For our “in between lunch and dinner” stop we went back to Seafire Grill Fajitas. 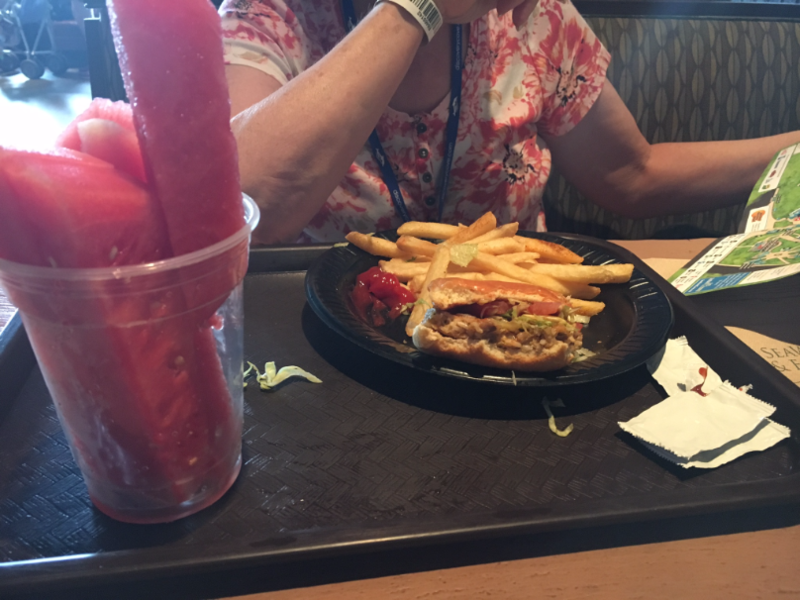 I just grabbed watermelon and a soda (I needed the caffeine) but mom decided to go ahead and try some of the fajitas. She also got a bottled water and watermelon. Our total would have been $26.91 without the pass. It was nice to get into the air conditioning and this was again a beautiful restaurant with a huge stage that I am sure has shows during busy season. I was super excited about dinner. 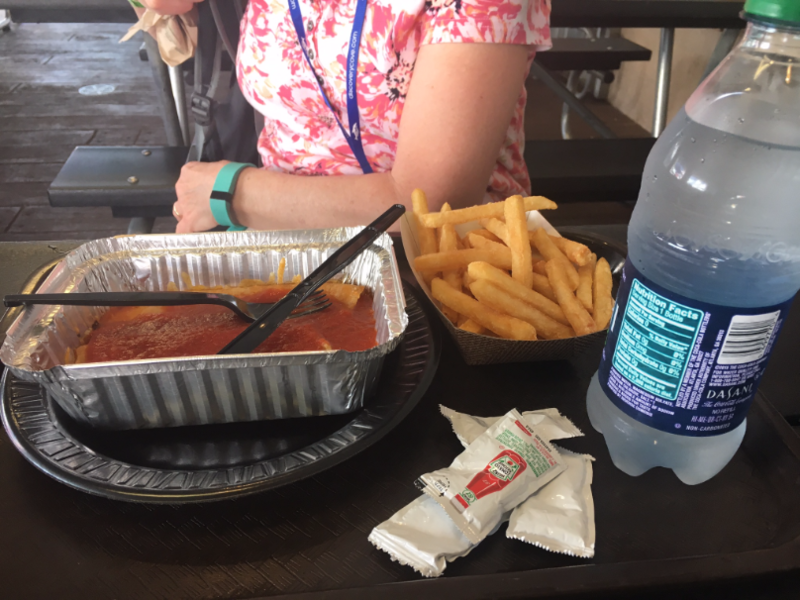 We were going to eat at the Expedition Cafe- which is right by the Penguin Encounter at SeaWorld Orlando– and that was my favorite thing at the park. 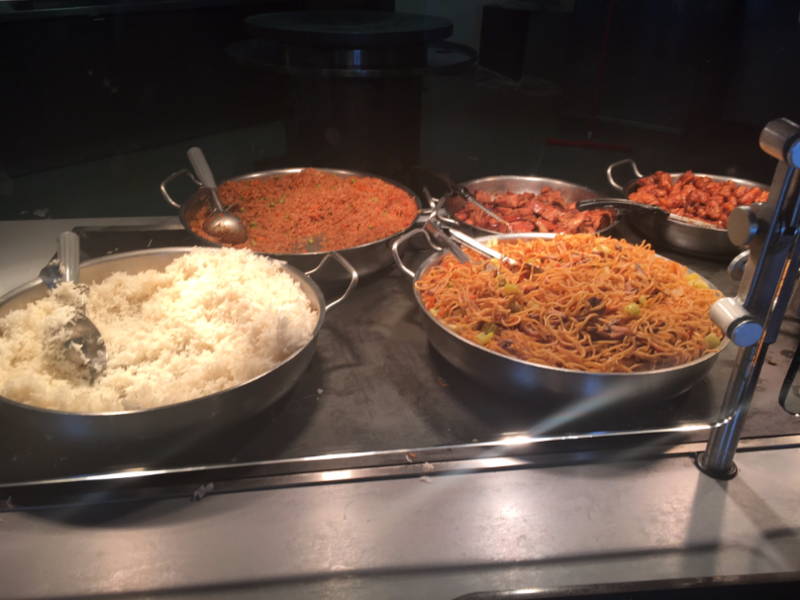 They have Asian Food- which is my all time favorite type! I also grabbed the carrot cake (see the picture on the top of this post). It was THE BEST THING I ATE ALL DAY. I don’t know if I was just hungry or what but it was yummy. My mom grabbed Italian food to try. And french fries- she ate more fries that day than I have seen her eat in several years. Our total without the pass $34.70. So what was the conclusion? 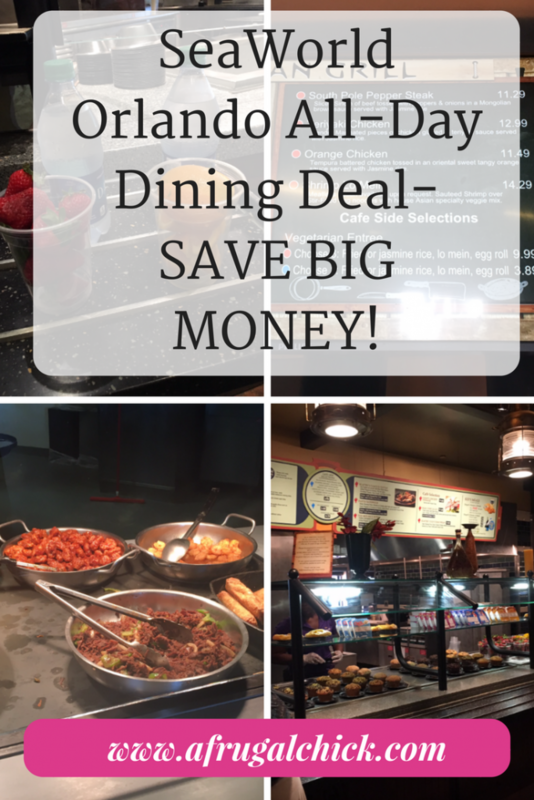 We paid $69.98 for two of the SeaWorld Orlando All Day Dining Deal. Our total for the day without the pass would have been $115.43. I have read some reviews from people who went with teenage boys. They saved hundreds of dollars. 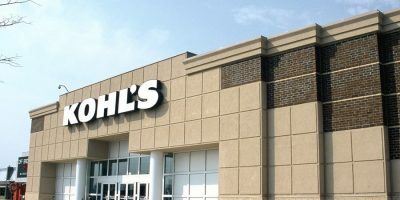 I’m not sure that for us it was a huge savings if we had been conservative about things. Neither of us eat meat so our meals tend to be a bit cheaper. We could have skipped several of the snacks and probably still be fine. I’ve never paid for dessert like that before. But it was WONDERFUL to be able to splurge for a day and try everything. If we didn’t like it we could just toss it and try something else. Ready to plan your own trip with this SeaWorld Information? Because you are frugal you need to use the right travel agent to find you all the best deals. 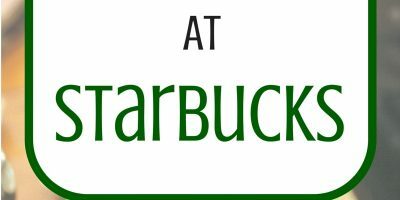 Check out A Frugal Chick’s Favorite- Destinations in Florida.